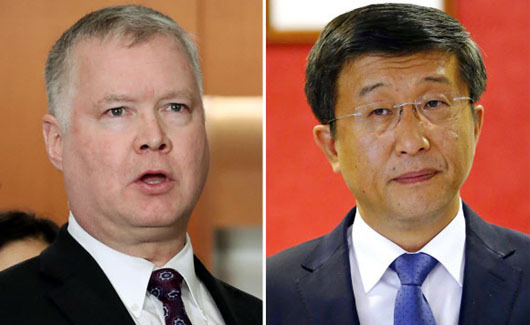 U.S. envoy Steve Biegun led an American delegation that arrived in Pyongyang on Feb. 6 for denuclearization talks with North Korean counterpart Kim Hyok-Chol. The U.S. delegation’s arrival in North Korea was one of a flurry of region-wide diplomatic moves ahead of a second summit between President Donald Trump and North Korean leader Kim Jong-Un, set to take place in Vietnam from Feb. 27-28. In a significant signal, Choson Sinbo, the pro-Pyongyang media outlet headquartered in Tokyo, referred to the negotiations for the second Trump-Kim summit as a move toward the normalization of U.S.-North Korea relations. “Throughout last year, the composition of DPRK-U.S. relations has shifted from ‘confrontation’ to ‘conversation’ and the ’70 year-old history of DPRK-U.S. nuclear confrontation’ is finally coming to an end,” Choson Sinbo said. In Pyongyang, Biegun and his team are expected to seek common ground with the North Korean contingent in the now-stalled denuclearization talks, although specific details have not been unveiled. “Expectations are that Washington and Pyongyang have already finished exchanging all their bargaining chips (for the second summit), but it still remains to be seen how they swap the cards,” said Kim Sang-Ki, director of the unification policy division at the Korea Institute for National Unification. Trump is “all-in” on improving relations with the North, Choson Sinbo said in the report which highlighted vice chairman of the Central Committee of the ruling Workers’ Party of Korea (WPK) Kim Yong-Chol’s visit to Washington, D.C. to deliver Kim Jong-Un’s letter to Trump and the following working-level talks between the two countries in Stockholm. Choson Sinbo’s report also noted that a group of U.S. university students visited the (pro-Pyongyang) Korea University in Tokyo. The students’ was led by Professor Derek Ford of DePauw University in Indiana. It was the first student exchange between DePauw University and Korea University through their joint project titled “Int’l Student Exchange Program: ISEP.” The U.S. delegation comprised 14 students and two professors. They toured the university’s campus, museum and historic sites from Japanese colonial rule, such as a site of Korean forced labor. Professor Ford also held an English lecture for students of the two universities on the subject of the history of North Koreans in Japan over the past 70 years after liberation from Japanese colonialism. Meanwhile, South Korea and the U.S. on Feb. 10 are expected to sign a preliminary deal on splitting the costs of their military alliance. South Korea reportedly plans to increase its contribution to around 1 trillion won ($890 million) in 2019. The contract, however, would last only one year. A signing ceremony will be held in Seoul, led by top negotiators Chang Won-Sam and Timothy Betts, reports say.